People have been scrubbing up for 2019 by tidying up their town centre after the New Year celebrations. 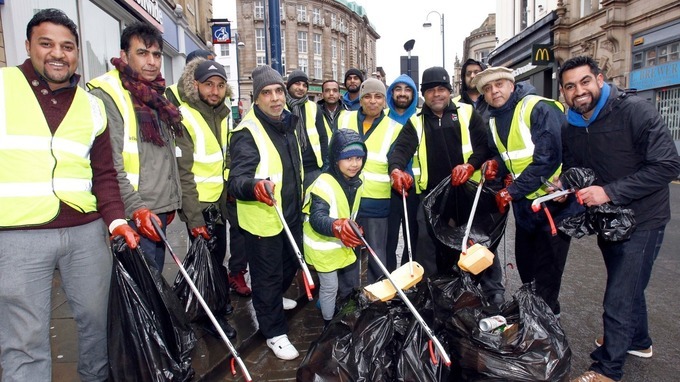 Members of Ahmadiyya Muslim Youth Association have spent the day clearing up litter in Huddersfield. They met at 9.30am, starting with a special prayer before tackling the streets. People from all faiths and backgrounds were urged to join the clean up. The youth association was organising similar tidy ups in 50 towns and cities across the UK. Fatihul Haq, President of Huddersfield Ahmadiyya Muslim Association, said: “Islam has given so much importance to cleanliness as it is considered to be a part of the faith. The Ahmadiyya Muslim Youth Association as been doing the New Year’s Day clean-up in Huddersfield for many years and each year the number of helpers continues to grow. To read original article, please click HERE.